Detroit Mich.—On Jan, 19 nearly 1,000 women defied a major snowstorm to rally at the Charles H. Wright Museum of African-American History. This “sister march” was sponsored by Women’s March Michigan, a separate organization from the National Women’s March. The main speakers were newly-elected Michigan women politicians, but others, from “Girls Making Change” to Water Warriors to Mothering Justice, broadened the rally to update everyone on local grassroots organizing activities. 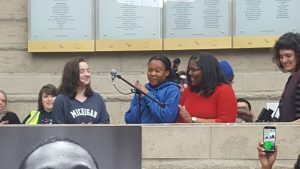 Girls Making Change, speaking at the Detroit Women’s March on Jan 19, 2019. Photo: Metro-Detroit Political Action Network. Siwatu Salama Ra (Free Siwatu) a Detroit justice activist, thanked the Black and feminist organizations (like the March for Black Women and her “freedom team”) who helped her gain freedom after a neighborhood altercation resulted in her arrest and incarceration for 248 days. “I gave birth to my son under unspeakable conditions,” she said, asking the crowd to give support to incarcerated pregnant women. “Love wins. We believe in our power,” she declared. 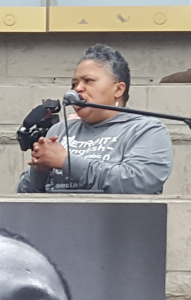 Monica Lewis Patrick, Water Warrior, speaking at the Detroit Women’s March on Jan. 19, 2019. Photo: Metro-Detroit Political Action Network. This entry was posted in Alerts & Appeals, Articles and tagged anti-Semitism, Detroit, Free Siwatu, Girls Making Change, Louis Farrakhan, March for Black Women, Monica Lewis-Patrick, Mothering Justice, Rashida Tlaib, Siwatu Salama Ra, Susan Van Gelder, Water Warriors, Women's Liberation Movement (WLM), Women's March. Bookmark the permalink.